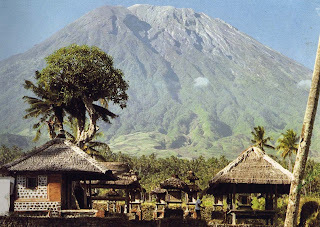 BALI is the word comes from "wali" which means ceremony or Pujawali (odalan) in Balinese. Hindu ceremony in Bali always use offering. There are many kind of offering that used during ceremony, from simple until very complicated one that not many people can make it. Offering is an embodiment of our thanks to the God or spirit because of their grace and bless. Offering should be fully done with sincerity of our heart . 1. 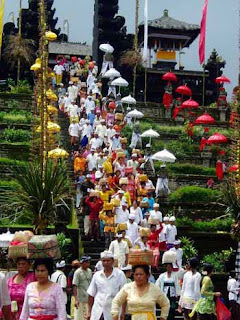 Dewa Yadnya : ceremony for the God which is conducted in the temple or at the holy places. 2. Pitra Yadnya : ceremony for the people who died include their soul. This ceremony are cremation ceremony and it's sequel. 3. Rsi Yadnya : Ceremony for the holy people like priests . 4. Manusa Yadnya : ceremony for the people since in the womb until before die, like Birthday celebration, tooth filing, wedding etc. 5. Bhuta Yadnya : ceremony for the spirits that people believe that they live around. This ceremony usually done around the sacred area or on the ground. As note that, almost every times we do one of that ceremony always combine with the others to make it balance. *Nyepi is a Balinese "Day of Silence" that is commemorated every Isaawarsa (Saka new year) according to the Balinese calendar. It is a day of silence, fasting, and meditation. The day following Nyepi is also celebrated as New year. Observed from 6 a.m. until 6 a.m. the next morning, Nyepi is a day reserved for self reflection and as such, anything that might interfere with that purpose is restricted. The main restrictions are: no lighting fires (and lights must be kept low); no working; no entertainment or pleasure; no traveling; and for some, no talking or eating at all. 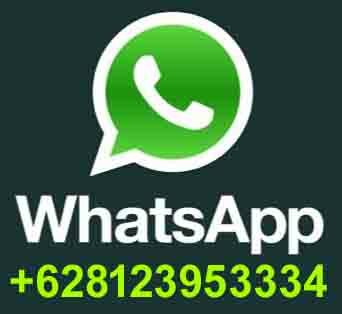 The effect of these prohibitions is that Bali’s usually bustling streets and roads are empty, there is little or no noise from TVs and radios, and few signs of activity are seen even inside homes. The only people to be seen outdoors are the Pecalang, traditional security men who patrol the streets to ensure the prohibitions are being followed. 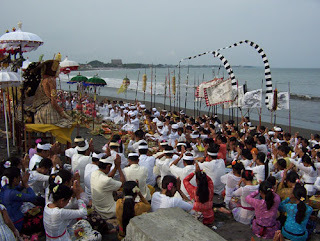 *First, The Melasti Ritual is performed 3-4 days beforehand. It is dedicated to Sanghyang Widhi Wasa. The ritual is performed in Pura (Balinese Temple) near the sea (Pura Segara) and meant to purify Arca, Pratima, and Pralingga (sacred objects) belonging to several temples, also to acquire sacred water from the sea. *Second, The Bhuta Yajna Ritual is performed in order to vanquish the negative elements and create a balance with God, Mankind, and Nature. The ritual is also meant to appease Batara Kala by Pecaruan offering. Devout Hindu Balinese villages usually make Ogoh-ogoh, demonic statues made of bamboo and paper symbolizing negative elements or malevolent spirits. After the ogoh-ogoh have been paraded around the village, the Ngrupuk ritual takes place, which involves burning the ogoh-ogoh. *Third, the Yoga/Brata Ritual starts at 6:00 a.m. and continues to 6:00 p.m. the next day. *Forth, the Ngembak Agni/Labuh Brata Ritual is performed for all Hindus to forgive each other and to welcome the new days to come. 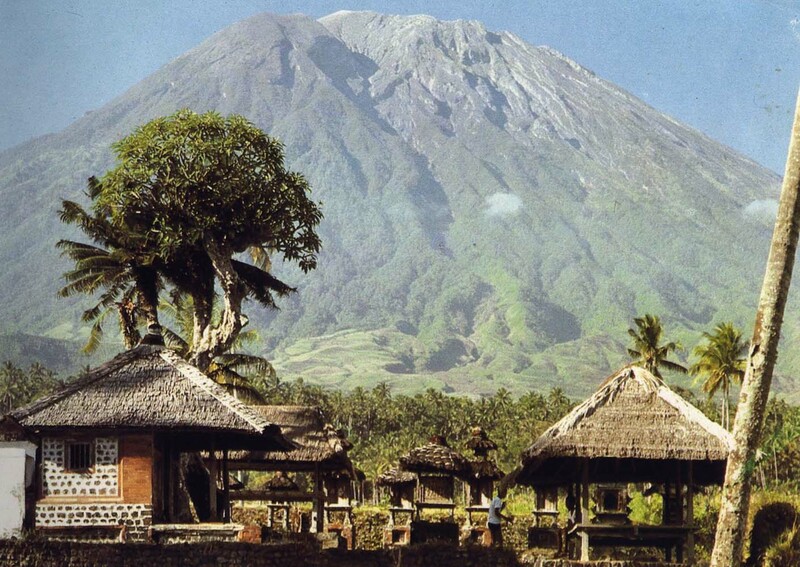 *Fivth and finally, The Dharma Shanti Rituals is performed as the Nyepi Day or "Day of Silence."